No respect for life. Or the law. It’s the trade. In sentience. Run by the Corranites, creatures that have always traded in intelligent alien life. Bought and sold. Nothing more than property. Rivka is having none of it. With an eye toward taking the entire supply line down, she launches into the greater galaxy. All the way to the heart of the Federation. It’s bigger than anyone knows. She calls all her friends and finds that she has woefully few. With a snarl and a mandate, she dives head first into the firepit of the Slave Trade. Magistrate Rivka Anoa is the legal eagle you want on your side. No better friend. No worse enemy. Judge, Jury, & Executioner is a stand-alone series in the Kurtherian Gambit Universe. No previous books need to be read. Just lock in your seat-belt, grab your favorite drink and be ready for your socks to be blown off. *** This book contains cursing. Perhaps humorous cursing, but cursing nevertheless. If this offends you, perhaps this book isn't for you. 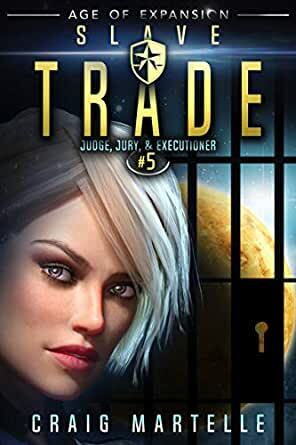 *Slave Trade* exceeds--or at least matches--the superb story telling of prior volumes in the Judge, Jury, & Executioner series. Character interactions are dynamic and dovetail nicely into frequent action scenes. General Lance Reynolds and personalities from Terry Henry Walton's bad company add punch to Rivka's overall mission. Highly recommended space opera. I look forward to purchasing and reading future books in this series. Another amazing story in this Legal Thriller series. Riva and her team take on a large galactic slave trade organisation as they help to bring a new planet into the Federation. The many different story lines are all exciting and we see many characters from related series getting into the action as well. I always pick up every book in this series as it has become one of my very favorites. Highly recommended. 4.0 out of 5 starsDo not get on the Magistrate's bad side. Unfortunately for the slave traders, it took absolutely nothing to find themselves there just by existing. Rivka and her crew have to figure out how to bring the traders down without breaking down the upcoming alliance. We meet lots of old friends in this book including Terry Henry and Char. It's a good ride! Another great story in the KGU. Fast paced, funny, some worrisome moments, all blended into a great both for fans and newbies alike. BTW, I LOVE Floyd!!!! She is a wonderful character, always puts a smile on my face. Awaiting your next magistrate story. 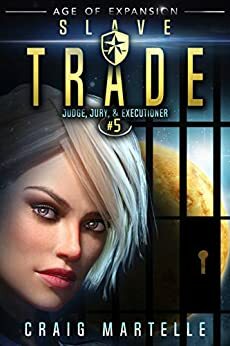 Don't let the premise of Lawyers in Space keep you away from this great series by Craig Martelle! It's got space and ground battles as well as clever plot twists and some terrific characters. Well worth the read!